1 week ago ago by Genesee Community College. Batavia, New York - What is a GMO? And perhaps more importantly, should you be worried about them? GMOs, or genetically modified organisms have found their way into most of the foods we consume – from plants and vegetables to animal products such as meat, milk, honey and seafood. So, where can you as a consumer, farmer, gardener or everyday citizen, get information and learn about the variety of perspectives on GMOs? 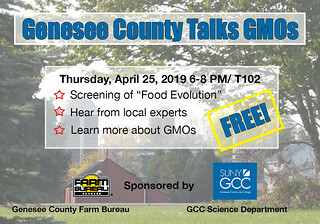 The Genesee County Farm Bureau and the Science Department at Genesee Community College have partnered to present “Genesee County Talks GMOs” on Thursday, April 25, 2019 from 6 p.m. to 8 p.m. in Room T102 of the Conable Technology Building on GCC’s Batavia Campus. This event is completely free and open to all ages from the entire community! 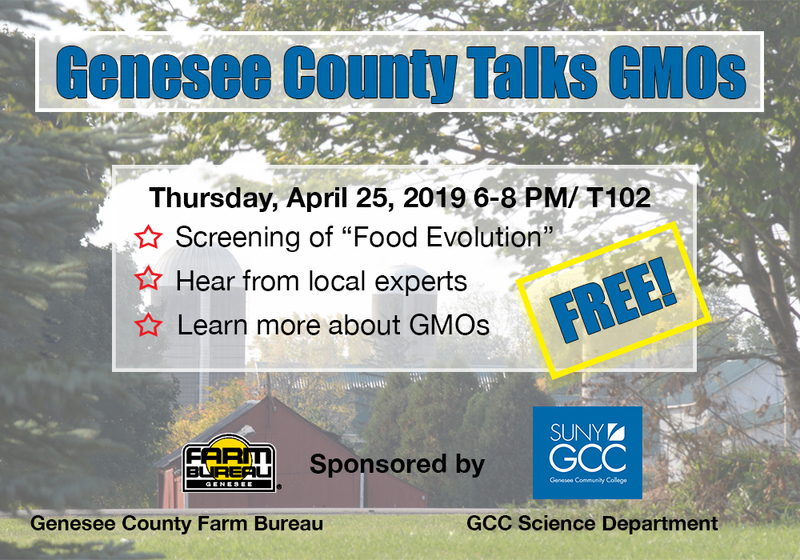 Guests will see a free screening of “Food Evolution,” written and produced by Trace Sheehan and Scott Hamilton Kennedy, and narrated by Neil deGrasse Tyson. “Food Evolution” is an impactful examination of the world’s current, yet vastly varying, views on GMOs, and the risks we take every day in believing or not in the information we are presented with. Anyone interested in learning even more about how food is produced is encouraged to explore GCC’s Food Processing Technologies program (FPT). GCC recently received a highly sought-after State University of New York (SUNY) needs grant and completed significant upgrades to student laboratories and equipment to provide the most up-to-date learning experiences. GCC’s FPT program was designed not only to prepare students to enter the workforce immediately, but to position them perfectly for a seamless transfer into a four-year degree program at any number of institutions both within and outside of the SUNY system. Learn more about GCC’s Food Processing Technology Associate in Applied Science Degree or contact Admissions@genesee.edu today. See how one GCC Alumni, Andy Willitis, of LiDestri Food and Drink in Fairport, NY used his FPT Associate Degree to further his career in this video. For more information, contact Crop Production Manager Emmaline Long at emma@cyfarms.com. Additional details about items in this release are available at: www.genesee.edu, www.foodevolutionmovie.com, and www.geneseecountyfarmbureau.com.